Out Loud HSV monthly open mic and features create a space for literary arts and spoken word to grow! Join us in Pizzelle's Confections, RR4 of Lowe Mill, for this open mic and release of our 2017 Anthology! Come early to sign up for the open mic where you will have 5 minutes to share your work. Then get first dibs on the latest edition of Out Loud HSV A Year In Review! 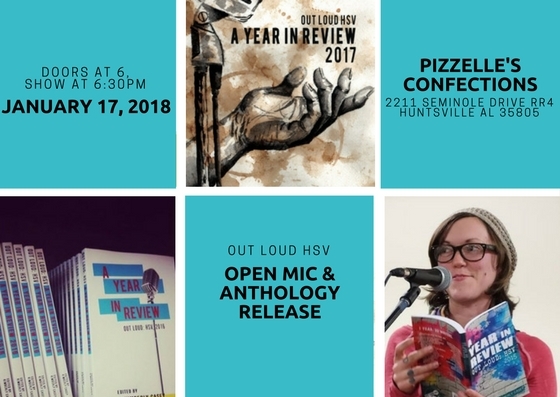 This collection celebrates the last year of Out Loud HSV participants by creating a space for everyone who shared on our mic in the past year to be published. Consider it a yearbook honoring all the voices in our community and all we've accomplished in the past year. This is our third year creating this project and its bigger and better than ever!